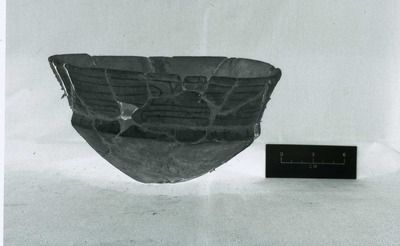 "41HS3, 774, Burial A-59" by Timothy K. Perttula and Robert Z. Selden Jr.
DECORATION (INCLUDING MOTIF AND ELEMENTS WHEN APPARENT): the upper rim panel has upper and lower sets of horizontal interlocking scrolls with horizontal and rounded scroll lines and excised bracket elements. The lower and narrower panel has sets of negative ovals defined by vertical excised brackets. Ripley Engraved, var. Pilgrims compound bowl (No. 774) in Burial A-59 at the H. R. Taylor site.